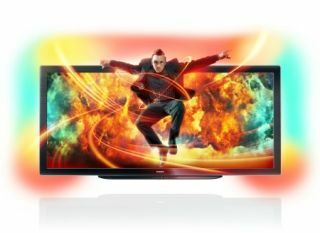 IFA 2011: Philips says updated Cinema 21:9 is 'fastest LED ever' | What Hi-Fi? Philips has announced a new version of its unique, ultra-wide Cinema 21:9 Platinum, and Philips is claiming its the 'fastest LED ever'. Aparently the set has a 0.5 millisecond response time as well as advanced features such as a 1200Hz Perfect Motion Rate. The 21:9 continues with 3D, of course, and while Philips now has both active (3D Max) and passive (Easy 3D) models in its range, this flagship model is unsurprisingly one of the active ones. Interestingly, Philips has also included the two-player full-screen gaming feature that was originally announced as part of the 9000-series back in March. Ambilight Spectra 3 is still included, as is Smart TV and Multi-View, which splits the screen into windows for watching multiple sources simultaneously. The price for the Cinema 21:9 Platinum will be £4000 when it arrives in UK shops in the coming months. Philips has also taken the opportunity to remind us of the Cinema 21:9 Gold - the Platinum's smaller and cheaper brother. This one uses Easy 3D and has a 400Hz Perfect Motion Rate, and has a price of €2199 in mainland Europe, with UK pricing yet to be revealed.